Cancer is a term used for diseases in which abnormal cells divide without control and are able to invade other body tissues. 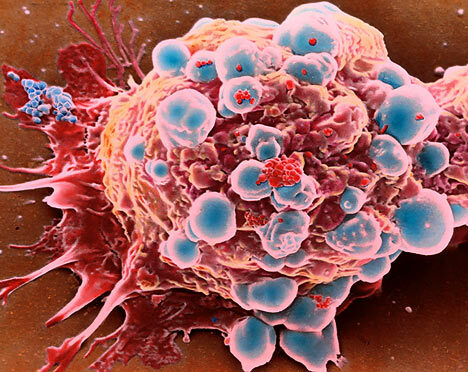 Cancer cells can spread to other parts of the body through the blood and lymph systems. 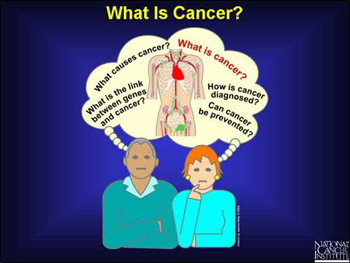 Cancer is not just one disease but many diseases. There are more than 100 different types of cancer. Most cancers are named for the organ or type of cell in which they start - for example, cancer that begins in the colon is called colon cancer; cancer that begins in basal cells of the skin is called basal cell carcinoma. All cancers begin in cells, the body's basic unit of life. 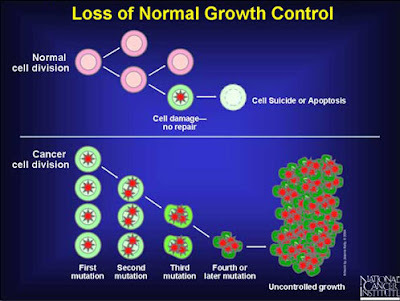 To understand cancer, it's helpful to know what happens when normal cells become cancer cells. The fundamental cause of cancer is damaged or faulty genes – the instructions that tell our cells what to do. Genes are encoded within DNA, so anything that damages DNA can increase the risk of cancer. But a number of genes in the same cell need to be damaged before it becomes cancerous. Most cancers are caused by DNA damage that accumulates over a person's lifetime. Cancers that are directly caused by specific genetic faults inherited from a parent are rare. But we all have subtle variations in our genes that may increase or decrease our risk of cancer by a small amount.